This San Diego boy recently had the privilege of visiting The Omaha Zoo, named by TripAdvisor as the Best Zoo in the US. Being from San Diego, we’re pretty prideful of our own World-Famous San Diego Zoo. Both are careful to downplay any competition. Yet, it’s hard not to draw some comparisons about which actually ranks among the Best Zoos in America. A flock of shockingly pink flamingos greets visitors inside the entrance of San Diego Zoo. It seems like every major city in the US is proud of its zoo. People get fiercely competitive about whose is best. On this visit to The Omaha Zoo, my friend Vera told me she had read someone’s blog post about this very subject. Evidently the comment thread went on and on, with people claiming THEIR city as ranking among the best zoos in America. But who is right? I think the answer might really be all of them. 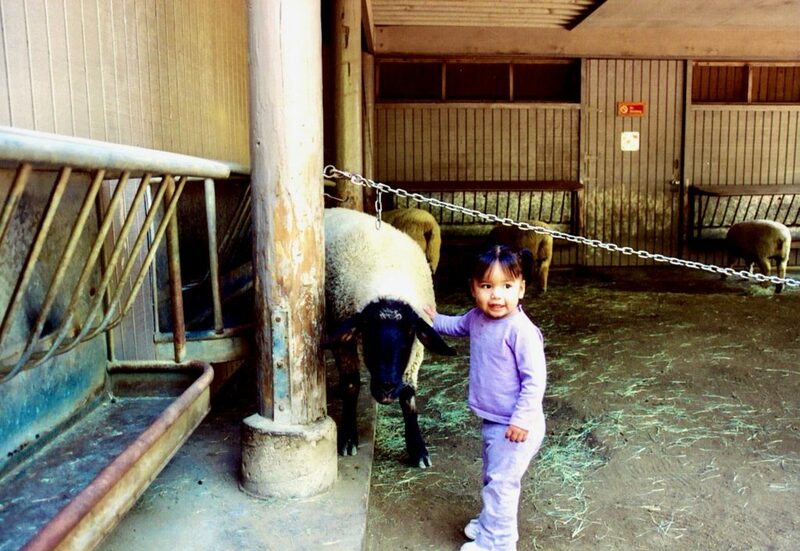 Even as a wee little girl, Sophia loved the Children’s Petting Zoo at San Diego Zoo. There are some things about The Omaha Zoo that really make it special. We visited in the early Fall, when the weather was not-too-hot and not-too-cold. Since the weather in Omaha can blister in the summer and freeze in the winter, we lucked out on timing. Still, the animals were visible, living in enclosures that mimic their natural habitats. They looked happy, healthy and well adjusted. Do you remember seeing caged zoo animals pace back and forth in front of the bars, anxious to escape? Well, not here. The herd of giraffes at Omaha Zoo are comfortably set inside their large enclosure. Children’s Adventure Trails – An interactive exhibit that highlights kids’ learning through play in nature. Located on five acres combining outdoor adventure with hands-on learning opportunities. 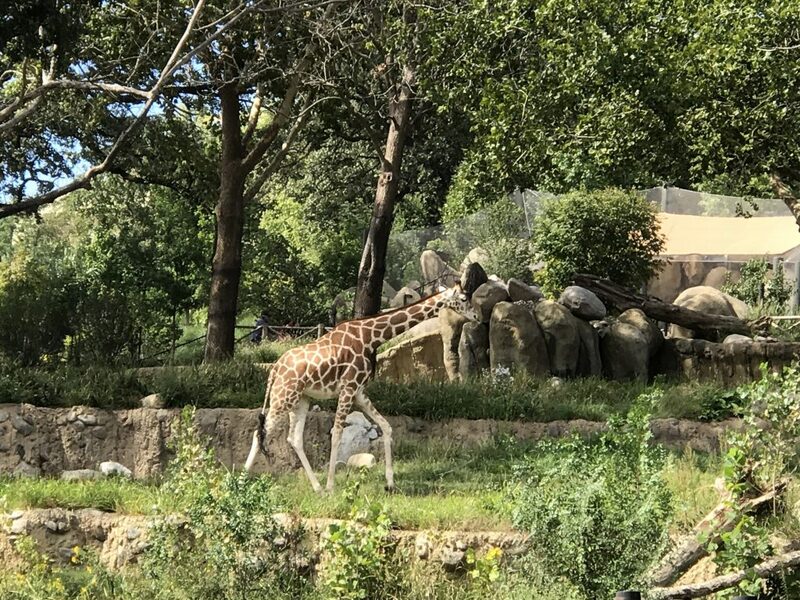 The African Grasslands – This is the largest project undertaken in the Zoo’s history, transforming 28 acres along the eastern boundary of the Zoo. 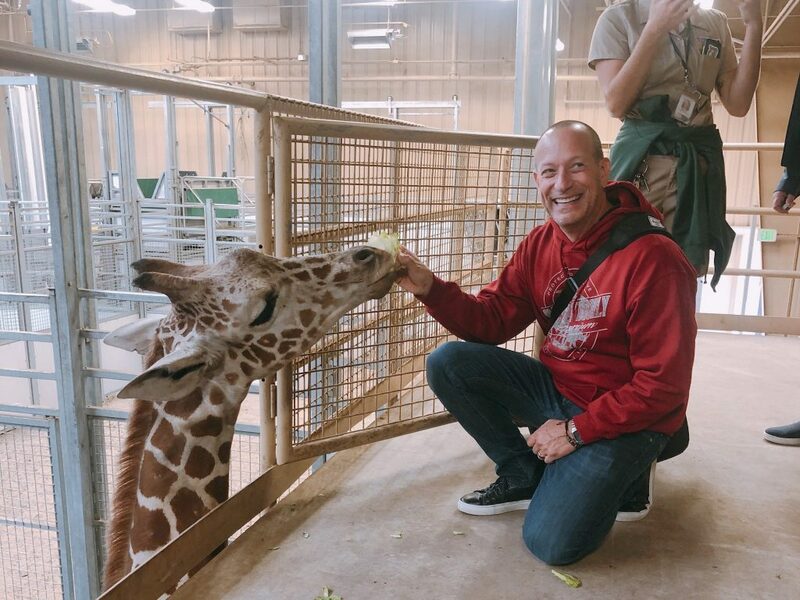 Malcolm the giraffe was very interested in our lettuce offerings behind the scenes at the Omaha Zoo. Suzanne and Walter Scott Aquarium – Discover polar regions, temperate oceans, coral reefs and the Amazon exploring the largest aquarium in a zoo. Expedition Madagascar – The island of Madagascar is home to some of the most amazing and unique animals in the world. 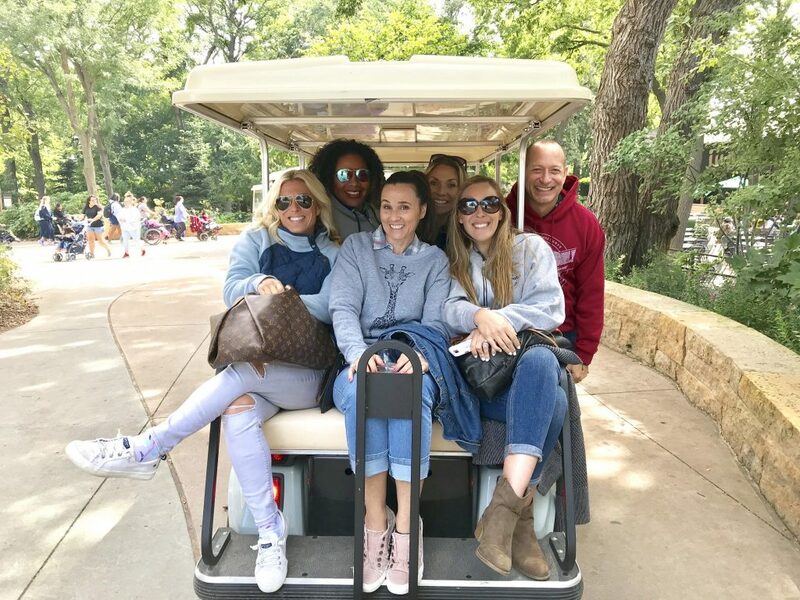 Riding in style, our gang had a personally guided tour behind the scenes at the Omaha Zoo. Pretty cool! Asian Highlands – Complete in 2019, Asian Highlands will transport Zoo guests on an immersive journey through Asia. Coastal Shores – Owen Coastal Shores, a new habitat for the Zoo’s sea lions, is scheduled to open in spring 2020. 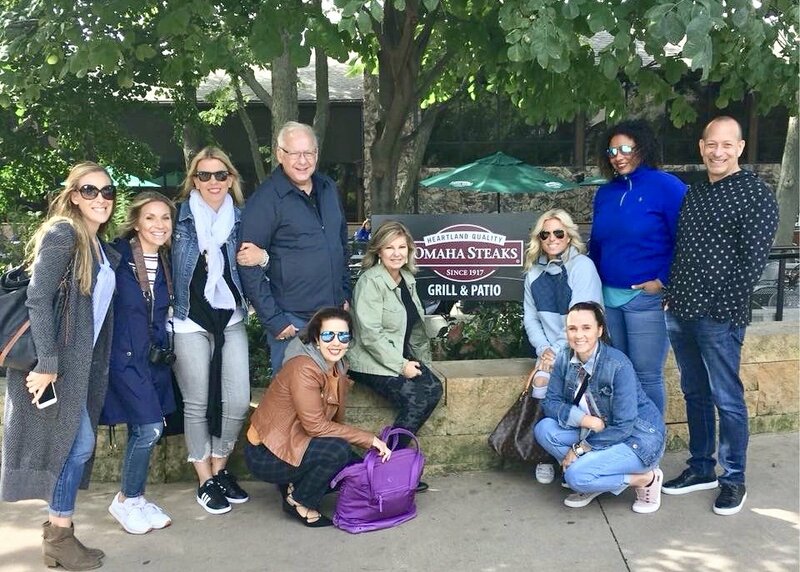 Our crew poses with Omaha Steaks CEO Bruce Simon at his namesake grill inside the Omaha Zoo. Spanning more than 100 acres within Balboa Park, San Diego Zoo contains some 650 species of animals and a collection of rare plants from around the globe. San Diego Zoo is truly world famous, welcoming nearly 3.5 million visitors each year. The zoo was founded in 1915, and has grown in popularity over the last 100+ years. 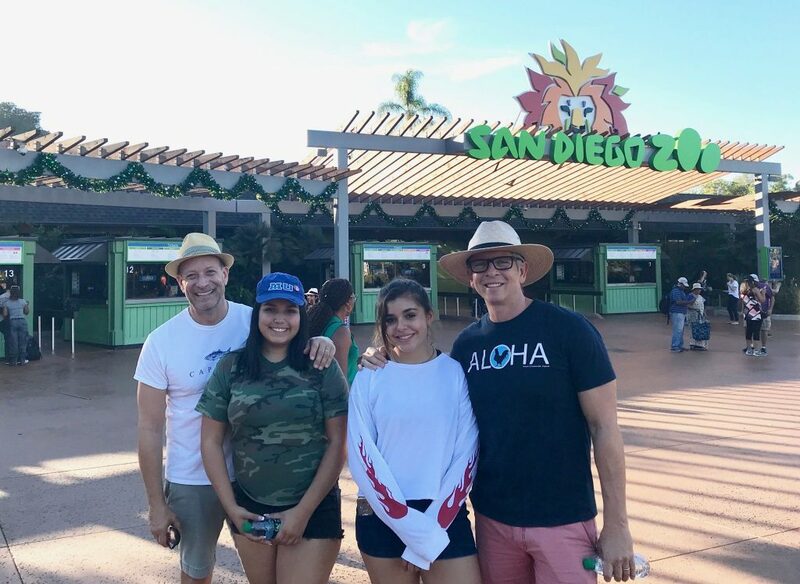 People come from all over the world to visit San Diego, and specifically to tour the San Diego Zoo. We’ve literally spent entire days there and never gotten to see everything, simply due to the vast collection they house. 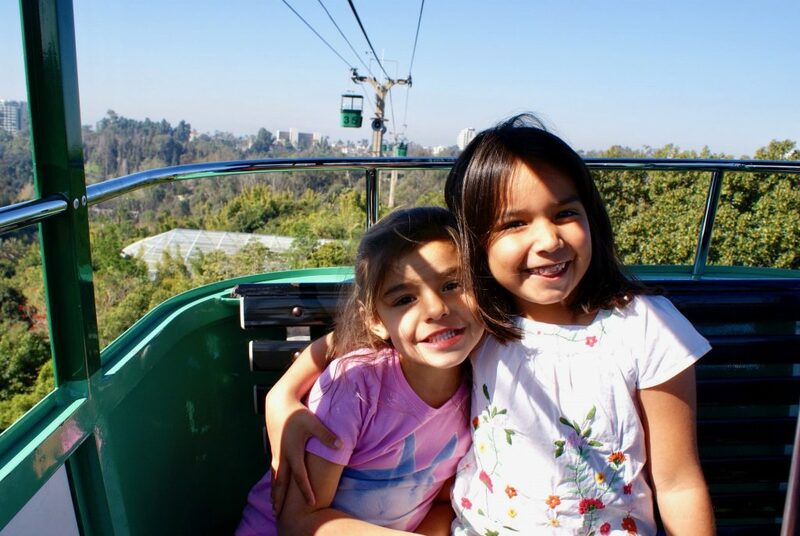 The Skyfari ride at San Diego Zoo has always been a favorite of our girls, since they were little munchkins. Long gone are the days when zoos displayed animals in cages, or god forbid, concrete enclosures. The San Diego Zoo is organized by zones that mimic specific conditions in areas of the globe like Africa, Asia and more. Animals are housed in these areas that are accustomed to those specific conditions – arrid, humid, etc. 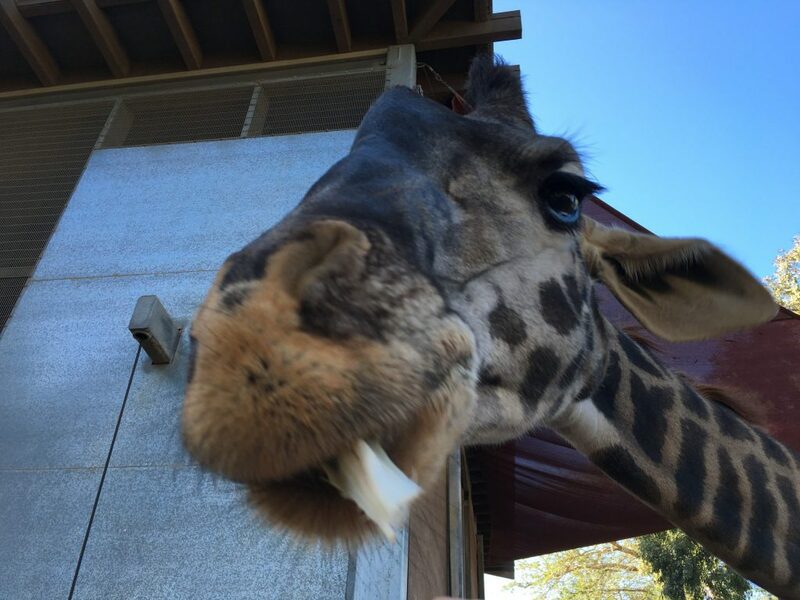 Feeding the giraffes at San Diego Zoo is an up close and personal experience. These zones are highlighted by animal enclosures so large and impressive that guests can forget they are in a zoo at all. Elephant Odyssey, for example, joins seven elephants in a 7.5-acre area where they can roam extensively. The Australian Outback features so many koalas in one place, you would think you were actually in Australia. One of our family’s favorites are the collection of aviaries. They are enclosed jungle oases guests can enter, walking among colorful and exotic birds from around the world. Africa Rocks – Recently opened on top of the west mesa, Africa Rocks is a gorgeous expanse that covers all the interesting terrains of Africa. Ranges from savannas to grassy plains and everything in between. New Children’s Zoo – A complete 2-acre redesign of the Children’s Zoo experience will provide authentic exploration of nature that intrigues and delights kids. Because San Diego is an extremely popular tourist destination, people travel from around the world to visit the San Diego Zoo. At any given time, guests can hear the languages of many lands. Chinese, Russian, Portuguese, Farsi, German, Dutch, French, Italian and many more languages are all spoken. 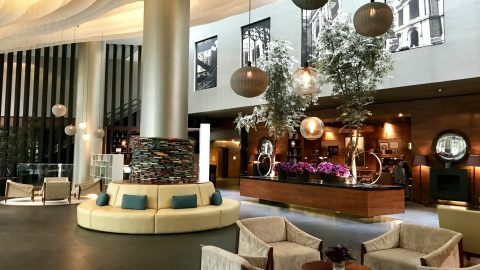 With 35 million visitors to San Diego last year, the city ranks among the top ten tourist destinations for visitors from outside the US. Conclusion on Best Zoos in America? Before we can really answer this question, we need to visit The Bronx Zoo, The Cleveland Zoo, Lincoln Park Zoo in Chicago and many others considered among the best. I know growing up in the San Francisco Bay Area, my parents took me to the Oakland Zoo on the regular. Somewhere there is even a picture of 4-year-old me holding a baby tiger cub (that is, before it peed on me!). As a kid, the Oakland Zoo seemed vast and absolutely full of animals. But of course, that was my only frame of reference. 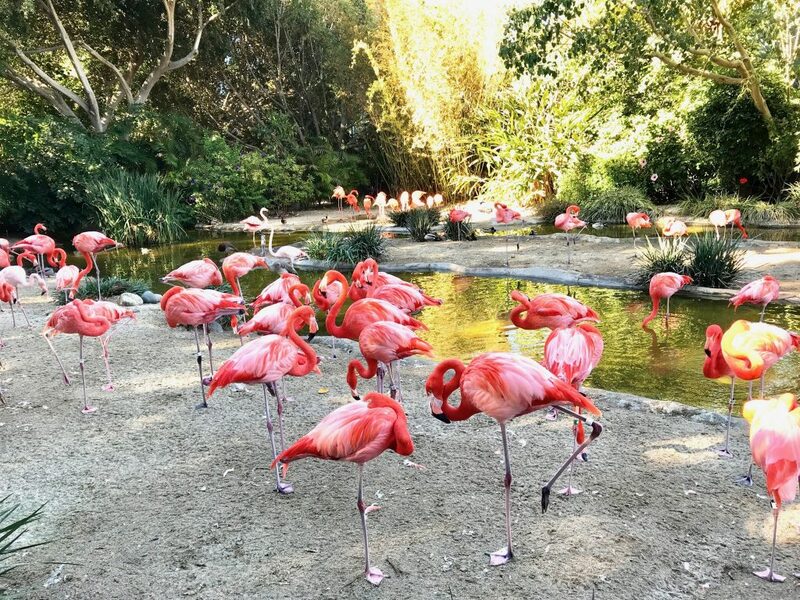 San Diego Zoo is still our family favorite, and that might have a little to do with the fact that it is 10 minutes from our house. We’re not sure we can fully say which should rank as the Best Zoos in America. What we can tell you is this: Omaha has a world-class zoo, and so does San Diego. Their missions are both identical – to help humans learn about and respect our planet’s species of all kinds. And to humanely preserve and protect them for future generations. Omaha Zoo or San Diego Zoo favorites aside, you can’t argue with a mission like that. 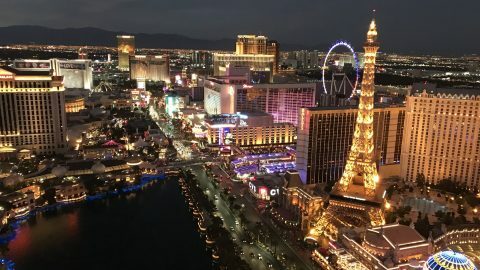 Next: Parents Getaway Weekend in Las Vegas – No Kids!